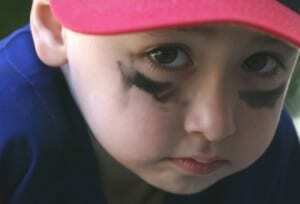 Are We Now Shaming Fat Kids at Major League Ball Games? This week the Baltimore Sun reported that first lady Michelle Obama was at Camden Yards, home of the Baltimore Orioles, to announce that Major League Baseball was joining her campaign to get kids to eat healthier and to exercise at least an hour a day. “The truth is that lots of kids just are not getting healthy foods and they’re not getting enough exercise,” she told a group of about 40 children brought to the park Tuesday morning to listen to her pitch and participate in a baseball clinic led by major leaguers. The next day, Dr. Lizbeth Binks, a clinical psychologist in Baltimire who specializes in PTSD, disaster, trauma and abuse, sent this letter to the editor of the Baltimore Sun (reprinted with Dr. Bink’s permission). By Lizbeth T. Binks, Ph.D. So the First Lady was at Camden Yards, in partnership with Major League Baseball, to fight childhood obesity. Who thought that one up? There are controversies: about whether obesity per se should be the focus, or health and healthy living; about how much the war on obesity is really a war on the obese, reflecting all kinds of cultural bias, prejudice, and oppressions; about how – once there is consensus on what the problems and solutions actually are – to help children, in particular, without destroying their joy in their own bodies, stigmatizing them, or promoting eating disorders. I can’t think of a worse place than the ballpark to act this out. We go to baseball games to relax, to feel camaraderie and national pride and a sense of belonging, to forget our cares and channel them into root root rooting. We are all the same tribe – or at most, two tribes – and it’s all usually fun and friendly and spirit building. If you are a fat kid, you can no longer count on that. I’m a baseball nut. Thanks for sharing- I would hate to keep myself and my kids home from Wrigley Field if we couldn’t have ‘Chicago Dogs’. They are all part of the experience.